Whitehall’s baseball team is starting to develop a flare for the dramatic. The Railroaders rallied to win a pair of one-run games last week. Whitehall took advantage of a sixth inning rally and a bases loaded strike out to win its first win of the season last Wednesday against the Salem Generals. Trailing by a run in the sixth inning, Whitehall scored twice to take a 5-4 lead and Justin Hoagland, pitching in relief of Dillon Griffin, snuffed a Salem rally to preserve the victory. Griffin had a strong performance on the mound, allowing four runs on only three hits in 6 2/3 innings, but ran into trouble in the final inning as Salem loaded the bases. Hoagland was called upon to work out of the jam, striking out the only batter he faced. Salem’s Josh Steele pitched a five-hit complete game and helped his own cause with two runs scored. The Railroaders scored a run in each of the first three innings to jump out to a 3-0 lead but Salem answered back with a pair of runs in the fourth and fifth innings, including a successful steal of home that put the Generals ahead. In the bottom of the sixth, Whitehall managed to tie the score and freshman Tyler Thomas reached base and eventually came around to score the game-winning run on a sacrifice fly. On Thursday the Railroaders broke a tie in the final inning to earn its second win of the season. With the game tied 7-7, Paxton DeLorme drove in Rehm on a single as the Railroaders defeated Argyle in walk-off fashion. DeLorme finished the game 3 for 4 with two doubles and four 4 RBIs, while Rehm scored three runs. Hoagland picked up his first win of the season for Whitehall. Seth Cook had three hits and two RBIs for the Scots. Argyle jumped all over Whitehall early, scoring five runs in the first inning. Whitehall battled back, scoring two runs in the second inning and a third in the third inning. They tied the score 5-5 with a pair of runs in the fifth inning, but Argyle answered back with two runs in the top half of the sixth inning to retake the lead. The Railroaders continued to display their resiliency, tying the score in the bottom half of the inning before scoring the winning run in the final frame. 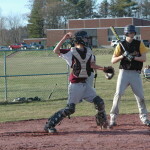 Whitehall didn’t need a rally to win Monday’s game, as they blew out Bolton 14-1 to run their winning streak to three games. Hoagland went 4 for 4 with two extra base hits, four RBIs and three runs, Paxton DeLorme went 2 for 4 with a double and an RBI and Carl Rehm struck out seven batters in five innings to pick up his first win of the season. The Railroaders jumped out to an early lead, plating seven runs in the first inning and Rehm held Bolton scoreless through five innings. Whitehall had an 11-run lead before Bolton was able to get on the scoreboard. Whitehall’s record (as of Tuesday morning) was 3-2. The Railroaders begin a crucial four-game road trip tomorrow with a game against Argyle, before traveling to Warrensburg, Hartford, and Salem next week. How they fare could go a long ways toward determining their postseason fate.